Have you ever had a video that was recorded vertically or sideways, and you wish it was orientated either horizontally or otherwise rotated? This is often the case with videos recorded on iPhone or Android phones shot with the notorious Vertical Video Syndrome, but the technique we’ll demonstrate works to flip or rotate any movie, even if it’s not from a smartphone. Perhaps the best part of this is that with Mac OS X you can easily and quickly rotate any video or movie file without requiring any added software to do so, as the feature is built directly into the OS X video viewing app QuickTime. It doesn’t matter if the video has been recorded as 4K, HD, or standard, slow motion or regular speed, or whether it’s your own video or another movie file from elsewhere. Thank you for this post. 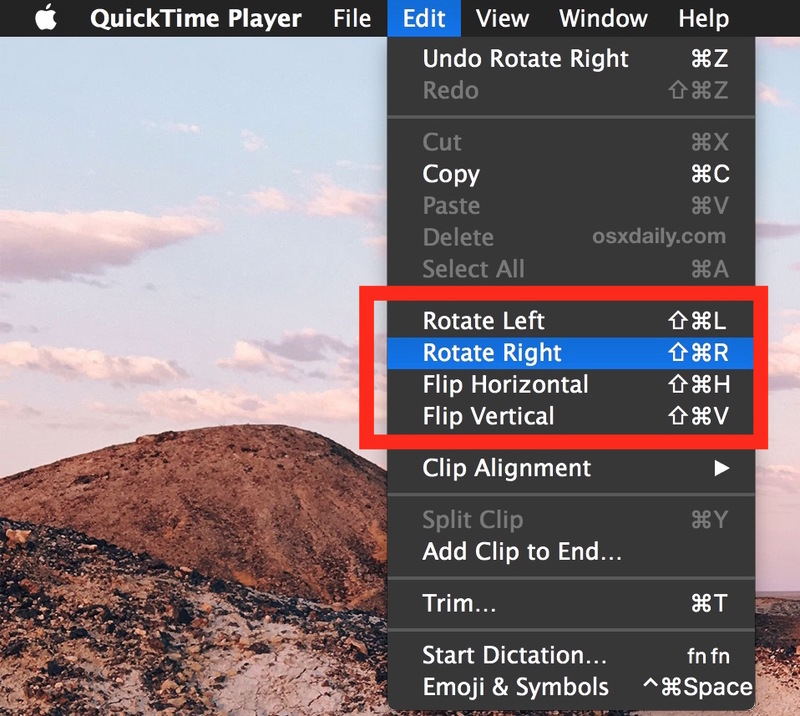 I have used the rotate feature in QuickTime many times. However, lately when I try to rotate a video shot on my Samsung Note 3, the video disappears (only a black screen remains), but the audio remains. It does not do this for all videos. Videos NOT shot on my phone seem to rotate fine. Thank you for the suggestion. Duplicating it actually didn’t work, but that gave me the idea to export it and try rotating the exported version. It lost a little bit of quality, but worked fine. YES! James, thank you for following through on this, as I was stuck at the rotated black screen. Much appreciated! Am I missing something? If you take a video into QuickTime Player and rotate it, yes you can do it, but the video is now on it’s side. I see another problem. I can rotate the movie in QT but I don’t see a save option. Do I need QT Pro or something? I just have what the OS gives me. You should have a “Save” option in the File menu, Apple sometimes calls it “Export” or “Share” (who knows why they change the name) depending on the version of software you are using. If you are on an older version of Mac OS X you may not have the rotate option. Never mind the above query. Although the “save” option isn’t there one is actually conducting an export. So I clicked on the red button to close this copy (made a copy of the movie on my desktop first) then the warning box comes up to ask if you want to export it and save. So put in the name there and the destination and all is well. My video is half vertical and half horizontal. How do I rotate just half of it? Thanks you! I have been able to rotate however when I go to File -Export I have to select 1080p, 720p, 480p, iPad/iPhone/iPod Touch & Apple TV, or iTunes only. What do I do here? Apple wants you to import videos from your phone to the computer using the Photos application. But if you then export the video in order to rotate and badly recorded video, and then import back into Photos, the date is wrong. A piss poor solution if you ask me. Apple should allow video rotation within Photos. Then in that window, click in the search bar and paste your video name. Once it’s found, click once on the file, and the path to the file should show on the bottom of the window. Double click the last folder in the string to open it, find your file and open it in Quicktime and perform the procedure above. Save the file with the same name to some easily accessible folder like the desktop, and drag it back into the folder within the expanded Photos library. Finder will ask you if you want to replace, and choose yes. The problem doing that with current versions of the QuickTime Player is that they turn a 4K video from an iPhone 7+ into a 1080 video, or one quarter its original resolution. Unless I am missing clicking something to reveal a Save At Original Resolution or 4K option. 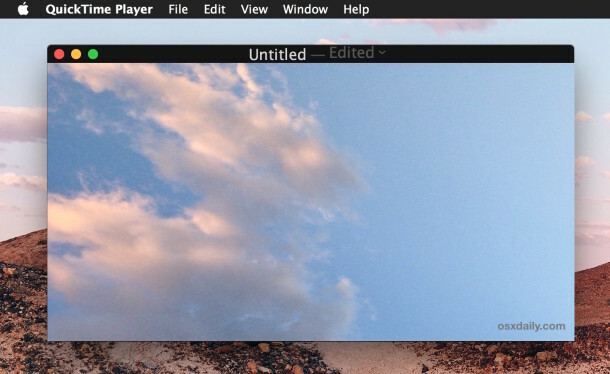 There’s no rotate option in QuickTime Player 10. Is this yet another example or Apple taking away functionality? I have never had a problem rotating videos in QT. Now, since upgrading to 10.12.5 Sierra and importing Android video I have this black screen issue. I thought updates were supposed to make things better? Not with Apple I guess. That company is fast becoming the new Microsoft. Im having this problem but it is new and for a strange reason. After using an sd card on my phone to store videos, the photos program doesnt see the files. I downloaded androidfiletransfer and now if the video is imported this way on a lg aristo or a samsung s3 it has the same result of turning black when rotated leaving audio intact. Very strange wish there was a fix! 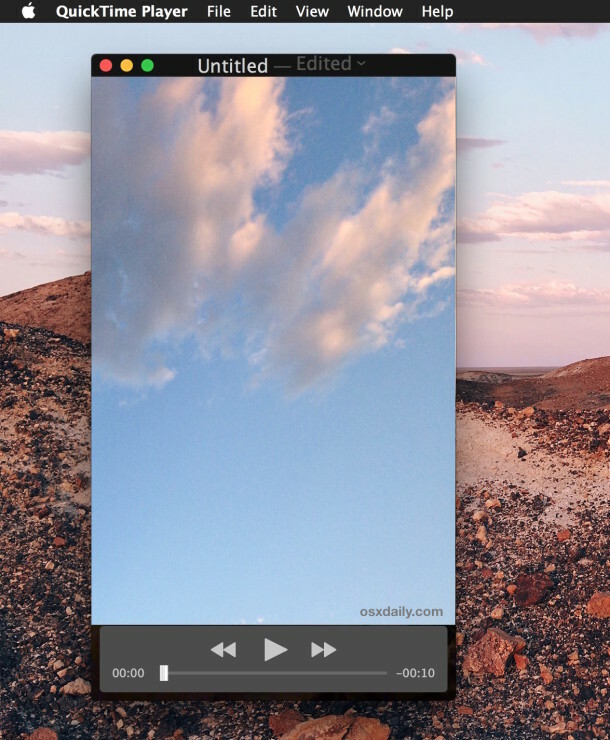 Quicktime will transcode your video if you flip and save it. Since it’s being transcoded, there will be some loss in quality, though minimal. Is there a way to flip and save the video without any loss in quality? Thank you for the tip. It worked, but when I reimport the rotated video to Photos, I noticed that it looses the metadata, such as location and date recorded. Is there any way to keep this data? Thank you James Post and Deluxe!! The black screen tip worked! !